On October 23, 2018, the largest single winning Mega Millions ticket was sold in South Carolina. The total reached $1.537 billion. The Powerball on that day was $620 million. That's a combined jackpot of $2.157 billion. That beats Mega Millions on March 31, 2012. Three winners split a $656 million jackpot. The winning tickets were sold in Illinois, Maryland, and Kansas. Those states don't have to reveal the names of the winners. On October 13, 2018, Mega Millions edged closer to the record, reaching $654 million. 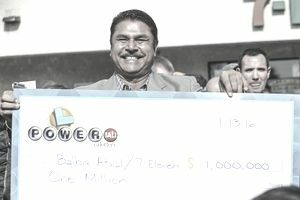 The prior largest Powerball payout was $590.5 million. Gloria C. Mackenzie, an 84-year old Floridian, won on June 5, 2013. The odds of winning either the Powerball or Mega Millions are roughly the same: 175 million to one. Despite those odds, one-third of Americans believe that winning the lottery is the only way they will ever retire. But how likely is it? Here's a humorous look comparing the odds of winning the lottery to some other lucky and unlucky events. That's followed by strategies that are more likely to win you a bountiful retirement. Similarly, you should start sleeping on the floor. The odds of being killed by falling out of bed are 2 million to one. You should also take showers instead of baths. The odds of drowning while taking a bath are 840,000 to one. But don't think you can improve your chances by avoiding cleanliness altogether. The odds of dying from flesh-eating bacteria are only 1 million to one. To put it all into perspective, consider this. Scientists have calculated that there is just a 300 to one chance that asteroid 2004 MN4 will strike the Earth on April 13, 2029. The asteroid is about a quarter mile, or 400 meters, wide. That is larger than the asteroid that carved out Meteor Crater in Arizona. It's also bigger than the one that flattened thousands of square miles of forest in Siberia in 1908.